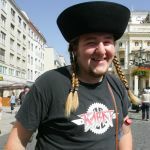 The large number of folk collectives and individuals from the field of dance, music, singing and folk literature in various age categories present their activities within the framework of numerous local, regional, national and international folk festivals which take place annually throughout Slovakia. Besides artistic performances, they are frequently accompanied by exhibitions and the sale of traditional craft products. The Folklore Festival “Východná”, the Myjava International Folk Festival and the Folklore Festival Beneath Poľana in Detva, organised under the auspices of the International Council for Organisations of Folklore Festivals and Folk Art (CIOFF), are the most famous festivals of this type in Slovakia. More than 1,000 participants from Slovakia and abroad perform there annually. The Folklore Festival “Východná” is the oldest and largest in Slovakia. It takes place in a newly-built area with two amphitheatres. The 28 metre-high Májka observation tower, from which a beautiful panorama of the High, Western and Low Tatras can be observed, is the dominating feature of this area. 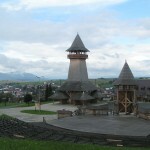 Besides its programmes in the amphitheatre, the Myjava International Folk Festival also offers its visitors a large number of accompanying non-stage programmes (such as the cuisine of our grandmothers, spirits tasting, creative workshops for children, folk school, etc) carried out in My-a-vy (‘You and Us’), the newly built festival town. The Folklore Festival Beneath Poľana in Detva offers not only performances of domestic folk art interpreters, but also presentations by Slovak folk collectives living abroad. The competition for Instrumentum excellens, the Ladislav Leng Prize for the production of traditional musical instruments, forms part of the Festival. The Hont Region Parade in Hrušov is another popular festival which by far exceeds the borders of the region. The festival is an event in which the entire village contributes. In addition to the stage programmes, visitors can get acquainted with traditional farming work in the Hrušov mountain settlements, joining in such activities as crop mowing and threshing, bread baking and charcoal burning. The local yards and cellars also offer the possibility of becoming acquainted with and tasting traditional gastronomic specialities. A visit to the Podroháčske Folklore Festival in Zuberec – Brestová also promises a unique experience. Nearby is the atmospheric Museum of Orava Village. Also close by is the village of Terchová, birthplace of legendary rebel Juraj Jánošík, which hosts the Jánošík Days in Terchová festival, the programme of which features performances by leading personalities and non-folkloric groups. 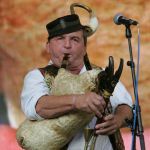 The Upper Hron Region Days of Singing and Dancing, with more than 50 years of tradition, and the Cassovia Folkfest in Košice are among the larger festivals. The village of Kokava nad Rimavicou in the Gemer Region is home to the Koliesko Festival of Folkloric Culture. Music presentations from the balconies and roofs of the houses in the square and the evening parties organised within the framework of thematic courtyards constitute the unique nature of this festival. Numerous regional and local festivals take place throughout Slovakia, especially in the summer months, which offer a more intimate atmosphere. These include the Pod Kráľovou hoľou Folk Festival in Liptovská Teplička, the Šariš Region Festival of Song and Dance in Raslavice, Abovské the Euro Folk Rozhanovce, the Spiš Region Folk Festival, the Gemer Region Folk Festival in Rejdová, the International Novohrad Region Folk Festival, the Pri Trenčianskej bráne Festival, the Trnavská brána Festival, and the Dubnica Folk Festival connected with the competition of humorous choreographies for the Mikuláš Senka Award, amongst others. The International Festivals of University Folk Ensembles, Academic Nitra and Academic Zvolen, which alternate annually, have a special place among folklore festivals. The International Festival of Children’s Folk Ensembles in Bratislava, organised by the Guild of Children’s Folk Ensembles and the Children’s Pod Likavským hradom Folk Festival, connected with the biennial competition of choreographies of children’s folk collectives, is targeted at presenting purely children’s folk ensembles. The festival of Košice folk ensembles, known as Košice Folk Days, constitutes a separate category. It features artistic programmes, a young choreographers competition, a folk music group competition and couples dancing competitions. The team dancing competition is held at the festival Bystrická Haravara in Banská Bystrica. 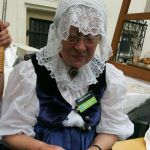 The European Folk Crafts (EĽRO) event in Kežmarok, presenting the folk producers and craftsmen from Slovakia and various countries of Europe is another significant traditional folk festival. 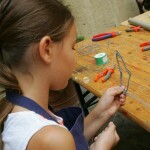 Students of domestic and foreign schools of arts and crafts also get the chance to demonstrate their skills here. Individual producers show their mastery directly before the eyes of the visitors who may also try their hand at individual craft techniques. Each year of this festival is organised under the sign of one of the guilds which existed in Kežmarok in the past. 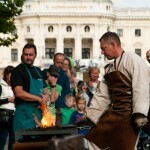 Since 1990 the ÚĽUV – Centre for Folk Art Production has regularly organised the Days of ÚĽUV Masters Festival of Traditional Production and Crafts in Bratislava. The Festival also marks the occasion for the award of honorary degrees of Master of Folk Art and Craft. ÚĽUV also organises the public fine art-craft competition Kruhy na vode (Circles on Water), which is orientated to open crafts friendly to design. Through this event it seeks to stimulate the origin of new work and to award and promote excellent products of arts and crafts, applied art and design. 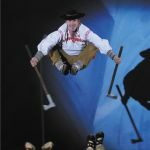 Several competitions and shows from various areas of dance folklorism are carried out annually in Slovakia, with the National Centre of Culture acting as organiser and expert methodological guarantor. In order to reach the national round, participants must advance from the district and regional rounds organised by the regional cultural centres. 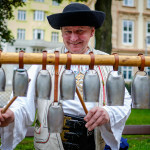 These competitions and shows include the the National Preliminary competition and festival of children’s folklore groups, the National competition in the Choreography of Folklore Groups, the Shaff’s Spur National competition for Soloist Folk Dancers, the National Competition in Programme Blocks of Golklore Groups, the Bearers of Traditions – national festival of folk groups, the National Festival of Children’s Folk Musics, Groups of Singers, Soloists, Singers and Instrumentalists of Folk Music, the National Competition of Creative Choreographies and the National Festival of Small Brass Bands. Individual competitions and shows are held every few years. Speaking about different-genre festivals, traditional music and dance have become a stable part of some of them. We might mention the Pohoda festival in Trenčín. The independent music dance tent, NAY Dance House, which has been part of the festival since 2006, promotes not only music production but also traditional Slovak folk dances and dances of other ethnic groups and cultures in an attractive and accessible way. It is headed by prominent Slovak and foreign personalities of professional dance life.